Strong trend for high nutritious food consumption owing to rise in health concerns among consumers should drive egg phosphatidylcholine market size. It is very effective for ulcerative colitis, hepatitis C, hepatitis A, peritoneal dialysis, tardive dyskinesia, alzheimer's, eczema, manic-depressive illness, premenstrual syndrome and weight loss. Dietetics are widely used and have witnessed increase in sales since past few years. PC (Phosphatidylcholine) is a chemical majorly present in egg yolk, mustard, sunflower and, soybeans. It is extracted mechanically or chemically from lecithin egg-yolk with the use of hexane. The compound comprises of phosphatidylethanolamine, lysophosphatidylcholine and sphingomyeline. Global lecithin market size was over USD 750 million in 2015 and expects gains at above 5.5%. Rising dietetics supplements and processed food demand due to change in consumer hectic lifestyle should positively influence lecithin market. Increasing awareness about health hazards along with growth in ageing population are foreseen to drive market. It serves as anti-ageing supplement and can increase neuroplasticity and boost brainpower. Global old age population over 60 years was approximately 900 million in 2015 and is forecast to surpass 2 billion by 2050. Elderly people are more prone to alzheimer, memory loss, liver problem and bone disorder which may promote anti-ageing demand and promote egg phosphatidylcholine market demand. In 1998, choline was added as a nutrient source and recommended for daily meal intake by NAS (National Academy of Sciences). Key choline properties consist of channeling methyl group for interchanging brain signals to prevent human body from memory loss and CVD. High content of choline along with nutrient density makes yolk as best source of nutrient which may boost egg phosphatidylcholine market size. Threat from low cost substitutes such as rapeseed, mustard and soybean may push suppliers to use them over yolk and may pressurize manufacturing costs. This factor can significant impact on egg phosphatidylcholine market price trend. 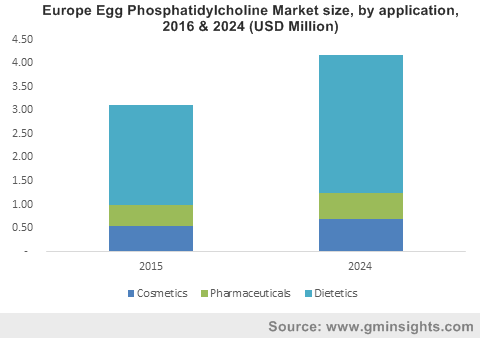 Egg phosphatidylcholine market size from cosmetic applications should register over USD 2.5 million by 2024. Cosmetic manufacturing companies have started applying new strategies for increasing their product portfolio and distribution network. It can be used as moisturizer, solubilizer and emulsifier for various ointments to beautify and maintain skin & hair texture and provide skin regeneration. Rising awareness among young population about natural ingredients usage in personal care & cosmetic products should drive egg PC demand. Egg phosphatidylcholine is also applied in lipodissolve, a surgery for damaging fat cells in human body. Rise in obesity concerns should stimulate lipolysis injection demand. Some countries including Brazil and Canada do not support these kinds of treatments due to numerous adverse health effects. Egg phosphatidylcholine from dietetic applications should witness highest gains at over 5.5%. Rise in healthy and nutritive food intake with choline source must drive product demand in dietetic applications. It is used in the treatment of neurological disorders and other medical applicatins. Also, socio-religion concerns for other nutritive sources including beef and pork may increase the egg phosphatidylcholine industry demand. Germany egg phosphatidylcholine market size expects gains at above 3%. Increasing anti-ageing cosmetic and dietetic products demand may drive egg PC market growth. The compound is also recommended in liver care programs by doctors and nutritionists driving regional product demand. U.S. egg phosphatidylcholine market size, was above USD 2.5 million in 2015. Presence of dietary supplement manufacturing companies like Covance, UL and Chubb should drive product demand. Increase in healthy food consumption among the consumers and FDA’s announcement as yolk to be an excellent source of protein should drive regional industry growth. More than one-third people in the U.S. suffer from cardiovascular disease (CVD) which causes approximately one out of three deaths. Thus, rise in number of CVD among population due to red meat ingestion would drive product demand in diet food application. China market size would exceed USD 1.5 million by 2024. China and Japan has over 20 percent and 30 percent of their total population above the 55-year age and 60-year age group respectively. Growing aged population in China and Japan results rise in skin problems and health disorders. Thus, growth in ageing population will increase egg PC demand as a medicinal supplement to treat various diseases. Global egg phosphatidylcholine market share is consolidated. Some companies operating in this industry are NOF America., Natural Factors, Nutrasal, Vitamin Research, Kewpie Corp, Harmony Whole, Lipoid, Avanti Polar and Jena Bioscience. Companies carry out their manufacturing process in their respective plants producing different phosphatidylcholine grades with respect to dietetics, pharmaceutical and cosmetic applications. Egg PC produces acetylcholine for operating of neurotransmitters in central human nerve system. American journal of Clinical Mission stated increase in choline dose, results in high increases post methionine-loading plasma homocysteine concentration in fit, healthy human beings. Some market players have begun to operate in manufacturing egg PC by lowering the cholesterol consumption and filed charter to FDA and many other European organizations. These initiatives may give a scope to the investing companies to spend in egg PC market growth. Also, poultry farm manufacturers feed fatty acid omega-3 to livestock, which should drive the egg phosphatidylcholine industry growth.